You don’t have to break into your piggy bank to transform your drab outfit into a chic one by pairing it with a chunky necklace. Chunky necklaces are available in bright, bold colours, and come in varying lengths and styles. Worn mostly as bold statement pieces, chunky jewelry is made up of beads, acrylic, plastic, resin, glass, metal, shells, wood or even gemstones. Due to its large size, a chunky necklace can stand out on its own but can also look great when worn with other necklaces as a layering piece. You can pair them with a buttoned down shirt or chic strappy dress. When you are wearing large and colourful statement jewelry, wear a solid colour and try not to have any florals or crazy patterns. 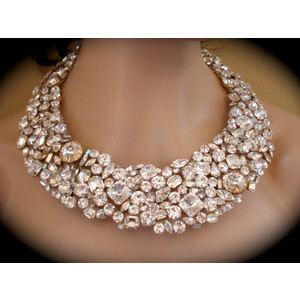 When you are wearing a chunky neckpiece, keep your other jewelry, accessories and make-up toned down a little. It shouldn’t be bright and gaudy. In order to make a bold statement, try to colour coordinate separate pieces, along with your clothing. A chunky, flowery necklace looks best when worn with a sundress, white or beachy looks. Several chunky necklaces together look tacky and cheap and are also unnecessary. You can be fashion forward by pairing a big necklace with a scarf or any other variety of neck wear. Keep your hair simple and try and tone down your hairstyle especially if you are opting for a very loud piece of jewelry. A loose ponytail, a clean bun or a sleek blowout will make your chunky jewelry noticeable. One of the key points to keep in mind is to not pair chunky necklaces with chunky earrings! You can wear one of the two. You can, however, wear a pair of small studded earrings to accompany it. The chunkier, the funkier, the bigger, the better! So, are you ready to ditch the small, delicate pieces and plan to go bold?